Booking your ceremony and reception site is a top priority after setting a budget. While you most likely have several venues in mind from time spent scrolling on Instagram, the fine print can often make the decision for you. Wedding venues typically have a list of preferred vendors, which is certainly helpful when discussing the logistics. 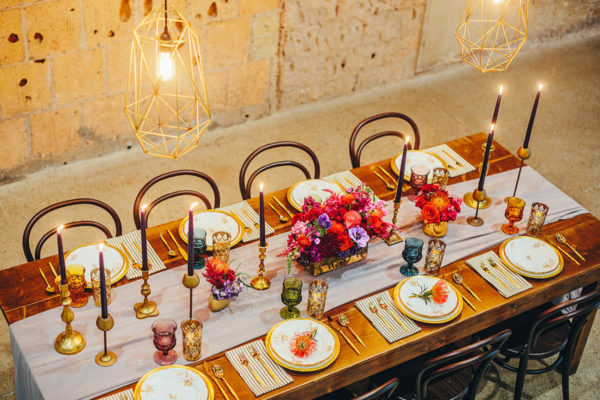 A list of preferred vendors means that the venue trusts the provider in question, can accurately estimate cost, and can often offer examples of how the wedding rentals would look in the space. If having your own vendors, from the table and chair rentals to the caterer, is a priority, then so is finding a venue that is flexible and willing to work with your requests. To help couples envision their wedding rentals, we like to create catalogs curated for venues we often work with. In addition to allowing you to see how some of our inventory will work in the specific space, it is a useful tool for planning the your overall look/feel of your big day. We love working with new venues, so if yours doesn’t already have a Party at the Moontower catalog, then we’d be happy to put one together for you. Understand your vision: Do you want it to feel intimate and romantic? Or more like a huge dance party? Learn your style: Do you prefer a classic style? Something more modern? Whimsical? Speak to function: Providing rentals that no only look good, but serve a purpose. If you are reading this, you probably know that your wedding rentals are an opportunity to really customize the space and make it your own. Whether you want to dive into the details or leave those to us, our goal is to help create a space that speaks to you and results in one hell of a party! The only “wrong” wedding rentals are ones that you don’t love! If you don’t know your venue yet, but are positive you love our design-forward chairs, we’re currently holding a chair sale that applies to any of our dining/ceremony chairs. Included are the Negroni, Manhattan, French 75, and Old Pal chair. Book by February 5th to get 40% off! 50% deposit required to book. Contact us to get an estimate now or submit a wishlist from any of the chair product pages (links above).